Guy J’s Lost & Found crosses over the Atlantic to New York City where rBrian Cid resides and works in his studio in the East Village. With residencies at some of NYC’s finest clubs – Pacha, Output, Sankeys and Cielo – this young DJ/producer/mix engineer is the definition of a multi-talented and ambitious music professional. His blend of percussive tech-house, deep vibes and progressive styling, all inspired by the golden-age of house music, along with his Latino roots and constant travelling, sees him join the dots between the old school and new school of underground dance music. 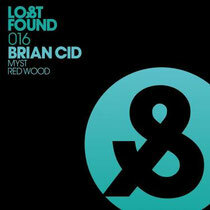 Listen to the percussion, throbbing bass and dreamscapes of ‘Myst’, along with the bouncy, tech energy of ‘Redwood’, and you will understand exactly why Guy J is so excited to have Brian Cid join the Lost & Found family. With a diverse range of DJs already declaring their love for Brian’s music - Hot Since 82, Richie Hawtin, Roger Sanchez, Luciano, Paul Oakenfold, Todd Terry, Steve Lawler, Umek, Danny Tenaglia, DJ Sneak, Stacey Pullen and many more – his Lost & Found debut should be popular. Guy J and the artists he features alongside his own productions, are exploring the psyche of electronic dance music, asking questions and tasting possibilities, forging ahead into the future.